Put dry ingredients in the food processor and pulse to blend. Add butter and pulse until crumbs form. Add water a Tbsp at a time, until dough just begins to come together, remove from processor and roll in a ball in plastic wrap. Let dough rest in the refrigerator for at least 30 minutes. Blend almonds and sugar in the food processor. Add egg, butter, flour, salt, and vanilla and pulse until thoroughly combined. In a small bowl combine cut fruit and lemon juice. Cover a baking sheet with parchment paper and lightly flour. On the parchment paper, roll dough into a rough circle of 12 to 14 inches. It doesn’t have to be perfect. Spoon filling from the food processor in the middle of the pastry dough and spread, leaving about a 2-inch border. Fold the borders of the pastry over the filling, pulling it together to hold in the filling. Mix the egg with a tsp of water and brush the edges of the pastry. Bake for about one hour until edges are lightly browned. Cool 15 minutes before cutting. 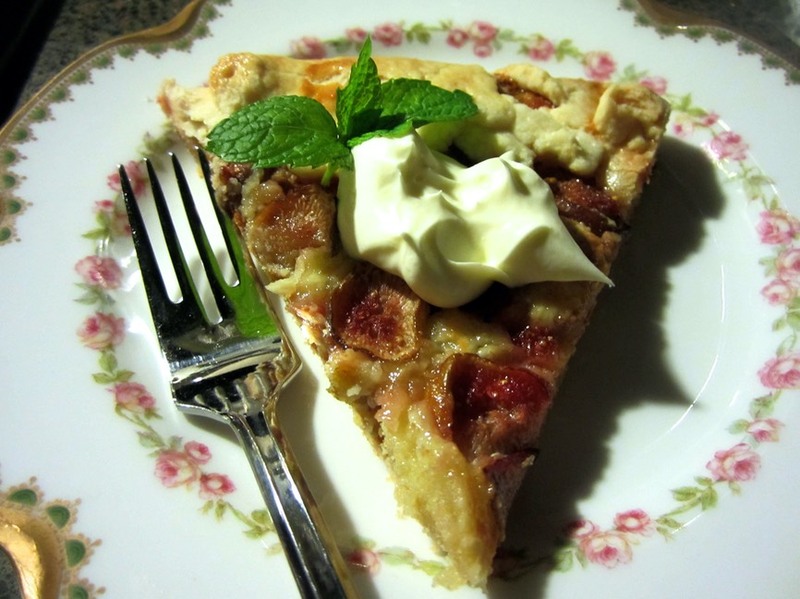 Top with whipped cream or crème fraische and enjoy.